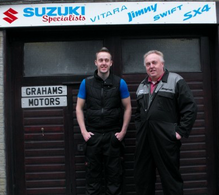 Grahams Motors senior mechanic is Graham Marson who has been working with Japanese cars for over 25 years. Graham and his family including his mechanic son Daniel who also works for the company, have owned and loved Suzuki cars for many years and can vouch for their great engineering. The nearest main dealer for Suzuki is over 10 miles away so this service is welcomed by many Suzuki owners and they can be assured their Suzuki is in safe hands.